The House of Soforte is a custom garment design service that allows clients to partner with our designer to create one of kinds creations from scratch. We Specialize in Bridal, Plus Size, Sweet 16's/Proms and Evening Wear for women. I attended NYU and the Fashion Institute of Technology, where I obtained my business and pattern making degrees, and I worked in several fashion houses in the garment industry. But I always had a strong desire to own my own company. This dream came to fruition in 1994 when I founded a home based business called Ambiance Couture. It was where I horned and developed my skills for well fitting garments. In 2006 I relocated to a boutique in Long Island, NY. There I reinvented Ambiance Couture renaming it The House OF Soforte, where the right look makes the difference. 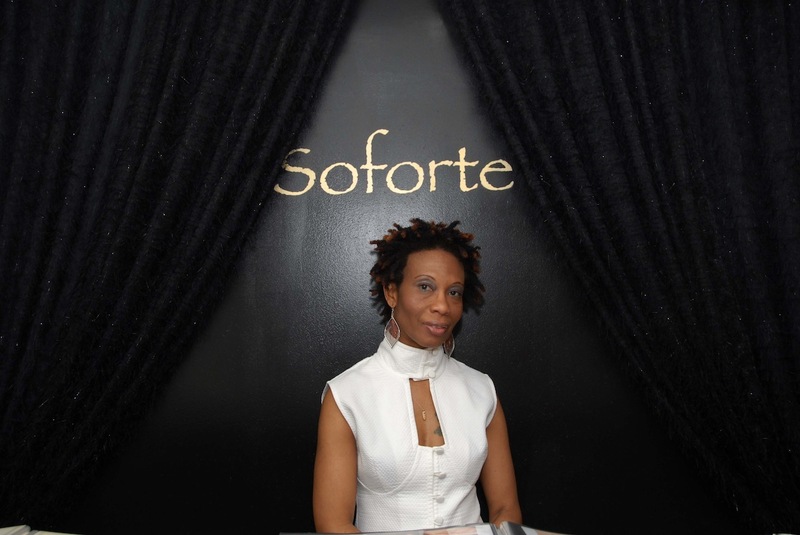 At The House of Soforte we continue to celebrate women of all shapes and sizes. The House of Soforte directly employs people and manufactures all garments in company owned work rooms in the United States. What kind of clients do you work with best? Clients who can appreciate the value of of having a gown that's designed exclusively for her, a gown that expresses her individuality. We love your gowns and portfolio. Everything sounds great. So can you tell me what makes the House Of Soforte different? I seek to ensure that my clients have a totally personalized experience by collaborating with them to help bring their ideas alive. I enjoy this process of working together as the end results yields a well fitted garment, and a satisfied customer. This all sounds so wonderful. How much are your services? Am I going to be able to afford this? We are a Custom Design company and our prices vary. It all depends on the garment style, fabric and embellishments you choose. You will be getting a custom gown designed to express your individuality; That is priceless. What type of client is not a good fit for the House Of Soforte? This sounds exactly like what I've been looking for. How can I get my custom made gown? 1. Take a look at our Photo Gallery - you will view a selection of custom made gowns that we designed for former clients. 2. Review our testimonials - you will hear from past clients in their own voice, what their experience was working with us. 3. Get In touch! You can call us or send a message via our Contact Us page to schedule a consultation, were we can work from your picture sketch or ideas. Thanks for visiting our website. Please feel free to contact us if you have any questions, or if you are looking for something specific. Contact Peggy K, to request custom made gowns that create lasting memories of your special event. Please fill out the form below and click "Send Message." We will get back to you as soon as possible!